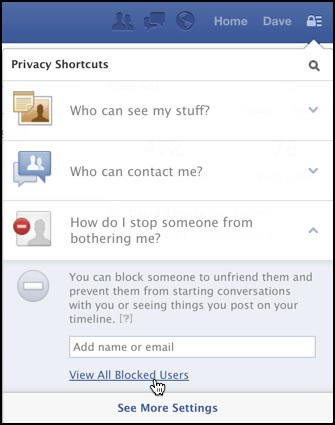 Just as I promised, here is a guide onView My blocked list on Facebook – How to Unblock People & Facebook Friends. I’ve had to block a number of weirdoes and creeps on Facebook in the last few years, including one ex who just wouldn’t stop bugging me. Now I’d like to review the list. How do i see who I’ve blocked on Facebook? Sounds like you’ve had more Facebook adventures than a lot of people, particularly the creepy stalker ex bit. Then again, I know a lot of people who have issues with a friend or two. Or should I say “friend” in quotes since really, if they’re creepy and bugging you, they’re probably not actually a friend, right? Social media overall has really forced us to redefine this whole concept of friend, actually, and now your friends are just as likely to live 2500 miles away as they are to be down the street. On a site where people share often intimate details of their lives, it’s also a fertile ground for creepy people to be, well, creepy, paying too much attention to others rather than focusing on their own lives. Blocking is reciprocal, so you also won’t be able to do things like start a conversation with them or add them as a friend. Keep in mind that blocking someone may not prevent all communications or interactions such as in apps or groups and only affects your experience on Facebook, not elsewhere on the web. Turns out that with the recent redesign, it’s surprisingly easy to see who’s on your own block list. See the tiny padlock with the lines adjacent to it? That’s the menu you want, it’s privacy and security. It’s the third option you seek. Yes, you can see I have blocked Caliban, Suhaimi and Desiree. All because of incessant spamming, actually. To give someone a second chance, all I need to do is click “Unblock” and they’re no longer blocked from seeing whatever you post or share to the public. Note: Removing a block will not restore the friend connection. If you block a friend and then remove that person from your block list, you’ll need to send them a new friend request. So now you know. Good luck, and remember, if they’re still creeps, you can always re-block them.